An anti-corrosive primer based on an epoxy resin and zinc phosphate as the anti-rust agent. High build, high fi lling capacity and easy sanding. For use as a fi lling primer in a two-component paint system on plywood and fiberglass and as an anti-corrosion primer in a two-component paint system on steel and aluminum. For optimum adhesion always thin fi rst coat on bare plywood and metal by 20-25% and apply by stiff brush. Fiberglass - steel - wood - aluminum: Bonding and filling primer for interior and exterior use above and below the waterline. 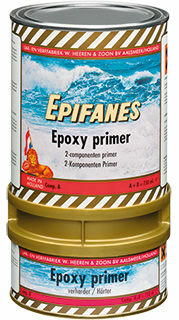 Also for maintenance of existing epoxy systems. Recoatable with Epifanes Poly-urethane Yacht Coating, Poly-urethane Primer, Interimcoat and Epoxy Filler.